This was at one time the commonest type of coccidiosis and is certainly the most easily diagnosed. It is caused by Eimeria tenella and results in lesions in the caecum of chickens worldwide. Morbidity is 10-40% and mortality up to 50%. Transmission as for E. mitis (see above). Production less affected than in some of the other forms of coccidiosis. Thickening, ecchymoses, of caecal mucosa. Accumulation of varying quantities of blood and caseous necrotic material in the caecum. Signs, lesions, microscopic examination of scrapings. Differentiate from ulcerative enteritis, histomonosis. Toltrazuril, Sulphonamides, Amprolium, Vitamins A and K in feed or water. Coccidiostats in feed, vaccination by controlled exposure, hygiene. E. tenella is more common when 'straight' ionophore programmes are used. Shuttle programmes with chemicals in the starter diet usually improve control. In some markets the organic arsenical compound 3-Nitro is used as an aid in the control of caecal coccidiosis. Vaccines are used mainly in breeders but increasingly in broilers. Recovered birds have good immunity to the same parasite. Figure 15. 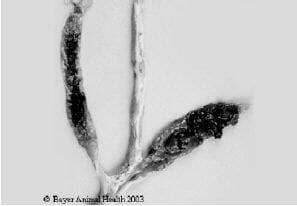 Moderate Eimeria tenella infection in the caecae of a chicken (Score 3). The caecal walls are thickened and haemorrhagic and there is a mass of blood in the caecal lumen.